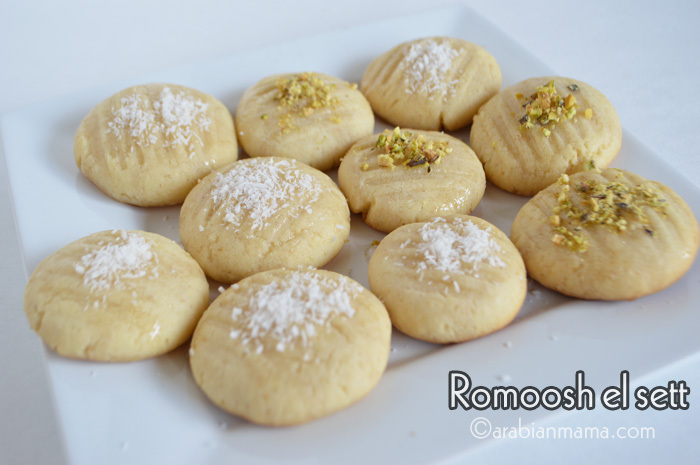 Soft, yet sandy in your mouth, this Egyptian Ramadan treat is a real feast for your taste buds. 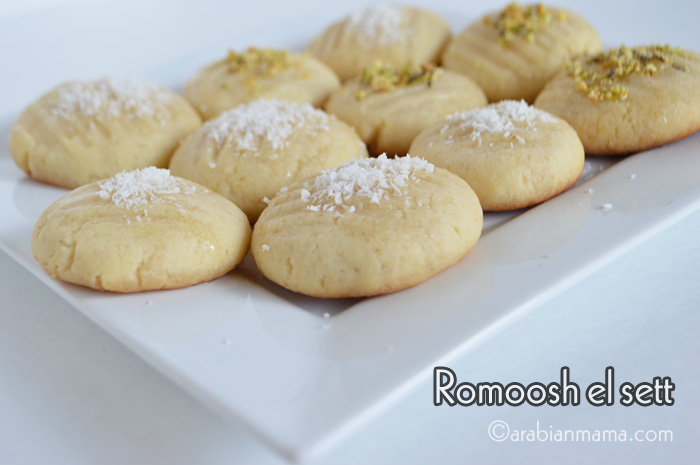 This post was supposed to be published in Ramadan but due to the high demand for the recipe, I’m posting it now. 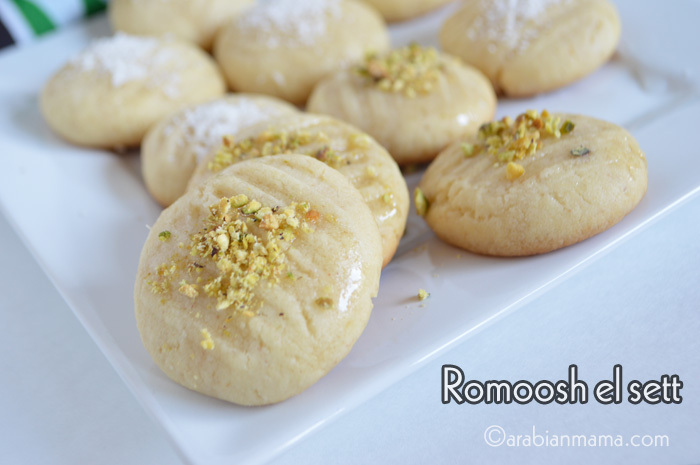 Romoosh el sett means the lady’s eyelashes, I know I’ve been posting recipes with weird names lately :), but rest assured you will not eat any lady’s eyelashes for real. 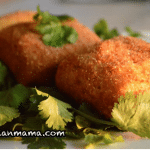 This is a very popular Egyptian treat that, I personally like, due to the existence of semolina or farina in the ingredients which give it a crunchy, sandy texture. These eyelashes should be dunked in syrup but instead I’ve just drizzled each with some syrup. These – sort of cookies- are supposed to be shaped like an eye with eyelashes – I’ve shown you how in the video down there- but for simplicity I’ve made shaped them into balls, pressing them down then put the eyelashes on top. 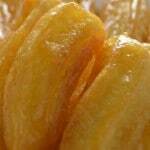 Here is a video to show you how to prepare this delightful dessert. 1/2 c unsalted butter- room temperature. 1/4 c finely grated coconut flakes. 1/4 c farina or coarse semolina. Crack the egg ,add the vanilla then mix very well. In a separate bowl, mix the rest of the dry ingredients together. Then add to the butter mixture and mix Until you have a nice soft dough. Roll into a ball, press the ball a little to flatten.Then make some lines using a fork. Bake in a 350F for 10-12 minutes or until the bottom is lightly brown. Usually it is dunked in the room temperature syrup but I've drizzled everyone with some syrup. This post will probably go live while I am up in the air, thousands of feet above the earth, heading to Egypt. I’m going to Egypt for the summer to visit my big family for nearly two months. My trip will take almost a whole 24 hours with three kids :(, I hope I will still be sane after this :). Have a nice weekend. I do have one question. In the video, you refer to vanilla. But the recipe above does not say anything about vanilla. So… I wondered… how much. Perhaps half a teaspoon? I was attracted to this recipe because of the name. Someone that I know keeps on bugging me to buy some fake eye lashes but now I won’t need to, if I try your recipe! I would love to taste these cookies, it looks like they melt in the mouth! I love the name of these cookies! And, I’m glad you simplified them for us – I like the idea of shaping them into balls and putting the eyelashes on top. Even I could do that! 🙂 And, I need to, because I love the coconut flakes in them. Pinned!